In those days after that tribulation the sun will be darkened, and the moon will not give its light, and the stars will be falling from the sky, and the powers in the heavens will be shaken. But the words of Christ are not words without hope. He notes how the angels of God will be sent out at that time, to “gather together His elect from the four winds, from the end of the earth to the end of the sky” (Mark 13:27). This same mystery is described by the prophet Daniel in our first reading. He also speaks about “a time unsurpassed in distress since nations began until that time” (Daniel 12:1), truly a period of darkness and suffering. Yet, Daniel is encouraged by the announcement that he will not be alone in the fight: “At that time there shall arise Michael, the great prince, guardian of your people” (Daniel 12:1). God never abandons us. He will always remain true to His promises, and He never leaves us without the protection and care of His holy angels. We thank God this weekend for the myriad of angels that stand ready to follow God’s every command, and who do more for us than we will ever comprehend on this side of heaven. Throughout Sacred Scripture, we find three central activities or functions that occupy the angels of God. Firstly, the angels worship God. From the Book of Genesis to the Book of Revelation, constantly we see the angels worshipping God in heaven and singing aloud His praises. Secondly, the angels carry messages. The word “angel” is taken from the Greek word for “messenger.” The Archangel Gabriel carried the message of the Messiah to the Blessed Virgin Mary. 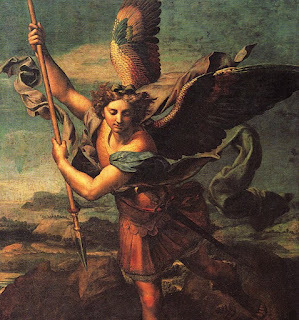 The Archangel Michael will carry the message of peace to Daniel when he is tired and weary. The angels bring us God’s message of encouragement and love in those places where we need to hear it the most. But thirdly, and there is no denying it, the angels of God are fully engaged in one final cosmic activity: they fight! They go to battle for the people of God against the powers of darkness, to protect us and to guide us in the paths of peace. They will stop at nothing to bring us into the eternal light that God is calling us to. They do not tire and will never cease to defend us and watch over us on our journey home to God. St. Teresa of Avila, in her autobiography, tries to discourage any attempts to live a spiritual life as if we were already in heaven. She writes, “We are not angels but we have a body. To desire to be angels while we are on earth—and as much on earth as I was—is foolishness” (The Book of Her Life, Ch. 22, #10). Nonetheless, we know very well how she also imitated the angels in the way she lived her life in the body, especially in these three activities we find in Sacred Scripture. How is God calling us this weekend, not to be angels, but to imitate the angels by the way we live our Christian lives? Because we, too, worship God in this place. Along with the angels, we sing His praises and adore the Lord. 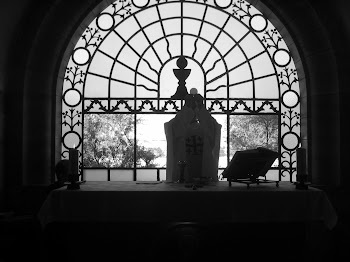 We worship God who comes to us here in the Blessed Sacrament of the altar, and we receive that “Bread of Angels,” strengthened for the work that God has called us to. Secondly, we also carry God’s message of hope and salvation to a broken world. By the way that we live and by the way that we love, we carry the message of the Gospel to those around us. There are so very many people who long to hear that message. Finally, we follow the example of the angels when we fight for those who cannot speak for themselves, for those who have been marginalized or who are suffering and in great need. Only at the end of time will we know how much good was done by our fidelity to our Catholic faith and by the fruitfulness of prayer. The greatest gift we can bring to those around us is to keep living our vocation well, to stay in the fight, and let God do what He wills by the power of His grace. “We are not angels but we have a body.” True enough! But in our bodies, we pray for the grace to imitate the heavenly messengers, and to trust that God is doing great things in our midst.